Refurbishing a cottage on Sanpere Island off the coast of Maine, caterer Faith Fairchild, her minister husband Tom, and their two lively kids, Amy and Ben, settle in for the summer with Faith’s best friend Pix’s mother, octogenarian Ursula Rowe, and are soon up to their lobster bibs in local gossip. The Hamiltons and the Prescotts have been feuding for generations in a continuation of the age-old lobster wars over who gets to trap where. Flamboyant real-estate agent Persis Sanford and hard-nosed Harold Hapswell, the developer of Sanpere Shores, an enclave of millionaires’ homes, are at odds when Persis isn’t too busy browbeating her unwanted son Kenny. And the ecoterrorists of KSS (Keep Sanpere Sanpere) are setting fires and scrawling graffiti in an attempt to keep Sanpere from turning into another Martha Stewartized Bar Harbor. Then Hapswell dies, maybe accidentally, maybe not, and Persis succumbs to a furious barrage of stab wounds. 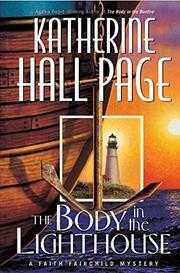 Faith, who divides her leisure between sauces and corpses (The Body in the Bonfire, 2002, etc. ), unfortunately turns up in the wrong place several times, earning first a mild concussion and then captivity in duct tape while she and the disrupter of Sanpere harmony set out to sea for a watery resolution. A return visit to Sanpere (The Body in the Basement, 1994) that features down-east directions to tourists (“You can’t get there from here”) and induces cravings for crab cakes and comfort cookies (recipes included). It’s all as cozy as any hand-knit shawl by the Sanpere Sewing Circle.